Seeing that one of your dog’s paws is swollen or red is alarming. It’s not normal and could be uncomfortable for your pet. But, you still need to find out the underlying cause. Thankfully, issues that cause swelling and redness of the paws can be identified and treated. More often than not, these symptoms are associated with a bite or infection. Knowing the type of infection can mean that you or your vet are better equipped to treat it. Dogs’ paws are quite sensitive, so while a condition that causes redness of the paws may not be life-threatening, it can be uncomfortable and tender for your pet. Specific symptoms go along with swollen paws. These give you a better idea of what your dog is going through and what you can do to help them. For example, treatment may be different if there’s an object stuck in your dog’s paw than it would if they have a bacterial infection. With that in mind, the best thing you can do is find out the reason behind the problem. Check your dog’s paws periodically, not just when they look like they’re in pain. Your dog can’t protect their paws on their own, so it’s up to you as the owner to give them as much help as possible. If they do have a swollen, red paw, treating it quickly will help to ease your dog’s pain. 1 What Are the Reasons for Swollen Paws? 1.7.1 What Do I Do if an Object is Caught in My Dog’s Paw? 1.7.2 What Are the Best Home Remedies for a Swollen Paw? 1.7.3 Can Swollen Paws be Prevented? 1.7.4 What Should I Do if My Dog Has a Swollen, Red Paw? What Are the Reasons for Swollen Paws? This guide will cover different reasons your dog might have redness, itching, and swelling on their paws or between their toes. We’ll also let you know which signs you should look for to determine if your dog’s paw is painful. Finally, once you know the cause of the problem, you can choose the right treatment for your dog. Many times, an official diagnosis from a vet is the best way to go. But, you can start looking for signs at home to get a head start on making your dog feel better. Dogs don’t have footwear to protect their feet. So, it can be easy for them to step on something sharp enough to poke through their pads. If they’re playing or get into a fight with another dog, a bite can also puncture their paw and cause it to bleed. If your dog’s paw does start to bleed and become red and swollen, they could be at risk for infection. The infection could come from the object itself if it were dirty. Or, it could come from the exposed wound meeting bacteria on the ground. Any kind of open wound is serious and should be treated immediately. But, it can be an even bigger ordeal when it’s on the foot, and your dog can’t cover it up. It’s vital to know what caused the puncture wound. If it was a nail, for example, your dog might need to get a tetanus shot. If the object that punctured your dog’s foot is still in the foot, it will need to be extracted. This can happen with things like glass, tacks, etc. If the foot becomes infected, antibiotics may be given by your dog’s vet. Bandaging up the wound will help. Dogs can be prone to ‘self-healing.’ You may find your dog keeps licking their infected toe if you don’t cover it up. Unfortunately, allowing them to do that can make the infection worse and cause more sores to appear. Dogs love to be active and exercise. Going for a walk might be your dog’s favorite activity, but something as simple as a walk might cause problems with their paws sometimes. Your dog may also land awkwardly after a jump, fall, or trip on something that can cause a swollen, inflamed paw. A swollen paw caused by these problems is usually one of the easiest to treat. 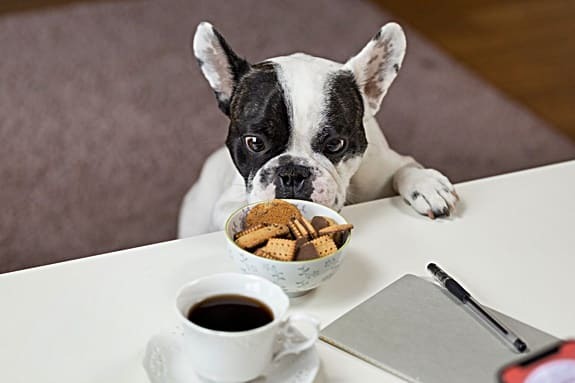 You may also notice your dog whimpering or whining, or even holding their paw up as though they don’t want to put weight on it. Make sure your dog didn’t sprain or break anything in their foot. This may take a trip to the vet. But, if the area is just swollen and bruised, something as simple as rest and an ice pack can help. Your dog should be back to normal in a day or two. 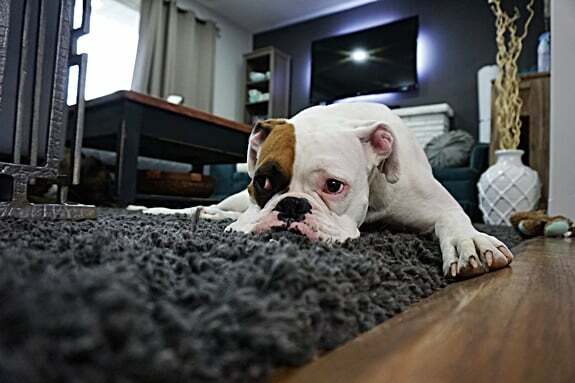 While it’s never fun to have to see your dog in pain, these instances are much easier to handle than an infection or underlying health problem. Dogs love being outside, but that exposes them to things like insect bites from ants and bee stings. For many dogs, this isn’t a problem. 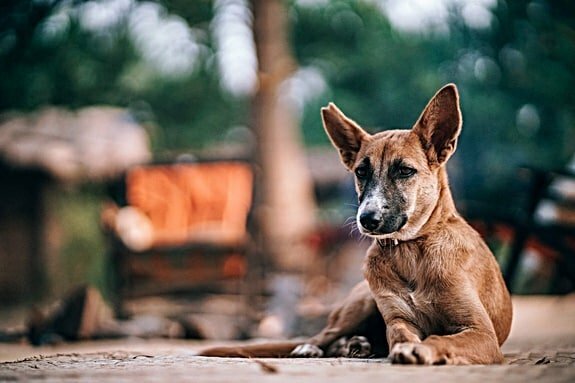 But, if your dog has an allergic reaction to a bite or sting, it could cause their paw to appear swollen and red. In these cases, the swelling is usually centralized at the top of the paw. 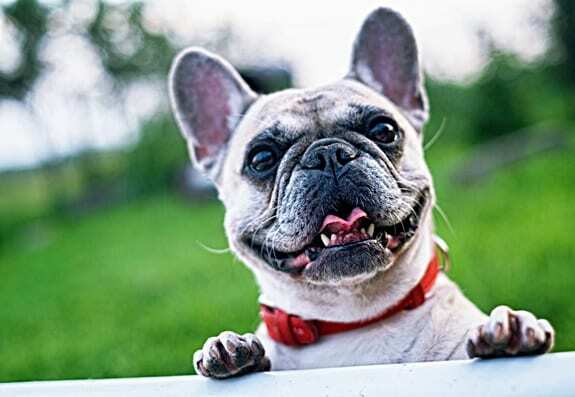 But, it can cause a lot of irritation to your dog who might try to lick or bite at the area, since it will likely be itchy. Most of the time, the swelling will go down on its own within 24 hours. You can use a cold compress or ice on the area to ease some of your dog’s discomfort. But, if you don’t see any changes in 1-2 days, take your dog to the vet. Dogs can be allergic to other things, too – just like people! If you notice that your dog has an allergic reaction to anything in your house, it’s essential to remove it as soon as possible. Accidents happen all the time for humans, and they can happen just as easily with dogs. You may not see your dog next to you or ‘underneath’ you, making it easy to step on them accidentally. Or, you may accidentally drop something heavy on them. If a heavy object goes down against their paw, you’ll deal with more than just a startled ‘yelp!’ You could do damage to your dog’s foot. If the object that lands on the foot is heavy, it can cause a fracture of the metacarpal bones. This fracture will cause a lot of swelling on the paws and will likely cause your dog to whine in pain and limp around. To confirm that the bones have been fractured, a trip to the vet is necessary. Your dog may need to wear a cast until the fractured bone is fully healed. They may have a harder time getting around in general as they age. This is especially true for larger dogs who may be more prone to joint issues. Some dogs can develop arthritis in their legs and feet. This can cause the paws to become swollen, inflamed, or even look deformed. Your vet can prescribe certain anti-inflammatory drugs to dogs with arthritis. They are designed to help with the pain. But, one of the best things senior dogs can do is reset their feet. Things like strollers or slings are great for keeping them with you and getting them outside for some fresh air while still allowing them to relax. Pododermatitis is a term that refers to inflammation on your dog’s skin. It typically occurs on or around the feet. It can be caused by bacterial infections, fungal infections like yeast, or certain parasites. Different medical and environmental conditions can also contribute. Things like cancer and thyroid problems can cause pododermatitis. Trauma to the foot or poor grooming can also add to the issue. Aside from the paw being swollen and red, there are a few other symptoms to look for with pododermatitis. If your dog is experiencing any of these symptoms, they may have pododermatitis. It’s a condition that can affect just about any breed of dog. But, some breeds seem to be more susceptible to the condition. A biopsy is usually needed on a piece of skin from the paw. This will help your dog’s vet to determine the cause of the problem better. The symptoms may be treated first if they are causing your dog pain or irritation. In most cases, though, your vet will prescribe antibiotics for a dog paw infection. Foot soaks, a change in diet, or even alternating between hot and cold packs can do the trick. It’s important to keep your dog (and their feet) healthy at all times. By doing this, you can help to prevent pododermatitis from happening due to environmental factors. Their risk for different types of cancer increases with age. Cancer is the leading cause of death in dogs over ten years old. Over 50% of dogs over the age of ten will get the disease. Cancer of the foot is no exception. There are several different types of foot/toe cancer dogs can get. But, many of them have the same symptoms. Treatment is different for each type of cancer, but you must get an official diagnosis from a vet. In some cases, the area affected by the disease will need to be removed. Other times, chemotherapy or radiation are required, especially if cancer has spread. Keep in mind that cancer moves quickly in dogs. Since it mostly affects older dogs, their life expectancy may not be lengthened that much, even with treatment. If you were able to find cancer early and it can be removed, your dog has a higher chance of making a recovery. But, if cancer has spread and your dog goes through treatment, it may only extend their life by a few months, or up to a year. What Do I Do if an Object is Caught in My Dog’s Paw? One possible reason for redness and swelling between your dog’s toes is an object that is stuck in the paw. A foreign object needs immediate action and care to be removed safely. If it isn’t, your dog could start to bleed and be in acute pain. Check each paw for anything that might be stuck between the toes. If your dog is favoring one paw, be sure to look carefully. Things like glass can be harder to see. If you can get to the object, you should remove it carefully using a pair of clean tweezers. Wash your dog’s paw with warm, soapy water. If your dog has an injury or you had to remove something from their paw, one great way to follow up treating it is with Epsom salts. You can create an Epsom salts foot soak for your pooch that will help to reduce swelling and provide some relief. Fill a bowl or basin with 1 liter of warm water. Add two tablespoons of Epsom salts. Soak your dog’s paws in the water solution for several minutes. Pat your dog’s feet dry with a towel, making sure they are dry between the toes. Repeat daily for best results until swelling is completely gone. What Are the Best Home Remedies for a Swollen Paw? Aside from an Epsom salts foot soak, there are a few things you can do to treat your dog’s swollen, red paw(s). Keep in mind that treatment should be different depending on the condition that caused the problem in the first place. But, these simple home remedies can help to reduce the swelling and give your dog a bit more comfort if they are in pain. 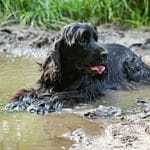 Iodine soak: You can create a different foot bath for your dog using iodine. Fill a basin with warm water and add a few drops of iodine. It should end up looking a bit like iced tea in color. Dunk your dog’s feet in the solution for a few minutes, then dry thoroughly. The iodine will help to reduce the swelling. 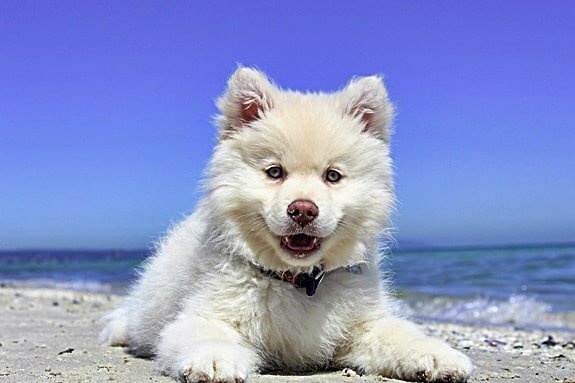 It will also help to get rid of any contaminants that might be lurking between your dog’s toes. This can help to reduce their chances of getting an infection. 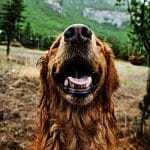 Apple cider vinegar: Have you noticed a cheese-like smell coming from your dog’s paws, as well as swelling? The problem may be a yeast infection of the paw. There are several ways to treat a yeast infection on your dog’s feet. But, sprinkling them with diluted apple cider vinegar is an excellent way to combat the fungus and get rid of the bad smell and other symptoms. Vaseline: If your dog is showing signs of itchiness along with their swollen, red paws, they might feel better if the pads of their paws are softer. A warm water soak can help with this. You can also rub a small amount of Vaseline or petroleum jelly on their pads. But, make sure they don’t lick it off. You can cover their feet with a bandage or special ‘boots’ to make sure the Vaseline stays in place. Cool chamomile: Sometimes, the paws of a dog can become red and inflamed due to burns or abrasions from hot asphalt, or even walking too much. You can soothe the swelling and the pain by soaking their feet in cool water. To bump up the relief, add a few pouches of chamomile tea to the soaking liquid. It will help to cool off the burning sensation on your dog’s feet. It will also help to bring down the swelling and get rid of redness. If there is discharge coming from your dog’s paws, it’s important to see a vet right away. Rest: Sometimes, dogs’ feet swell up simply because they’ve been over-exerted. As stated above, too much exercise can be the cause of swollen, red paws. One of the best ‘treatments’ for this is rest. It can be hard to get a dog to stay in one place for long. But, encourage rest and relaxation for them. If you need to put them in a crate to make sure they don’t run around, try it for at least a few hours. This will give the swelling time to go down. Can Swollen Paws be Prevented? Because there are so many factors that can cause your dog to get a swollen, red paw, it’s not always possible to prevent it from happening. Always keep your dog’s nails trimmed. This will help to prevent them from catching or snagging on anything and pulling. If your dog has a lot of fur between their toes, keep it trimmed. It’s easy for debris to get caught in this fur and dig into your dog’s feet. Practice good hygiene with your pooch’s paws! Keep them as clean as possible and always keep them dry to help prevent fungal growth. Give your dog’s paws regular checks, especially after they’ve been walking around outside or playing. This will make it easy to find any objects that might be stuck or any bites or stings that may have occurred. As you can see, it isn’t difficult to make sure your dog’s feet stay healthy. With just a few minutes each day, you can reduce the risk of something serious affecting their feet. Even if they do develop a medical condition, checking their paws regularly can give you the opportunity to catch it early on. When it comes to infections or things like cancer, finding it early usually means it can be treated faster. What Should I Do if My Dog Has a Swollen, Red Paw? The best thing you can do if your dog is having problems with their paws is to try and determine the cause. If it’s something obvious like an object, take the time to remove it and treat the area. But, if you see the symptoms of an infection or medical condition, it’s essential to get it checked out quickly. It can be a scary thing to see your dog in pain or notice that their paw is swollen, itchy, and red. Don’t panic! Instead, follow some of the guidelines listed in this guide to give you a better idea of what might be going on. Once you recognize some symptoms, you can take the right steps in treating the problem. That might mean treating it yourself at home or taking your dog to the vet for professional treatment. Dog Stung by Bee on the Paw and Limping? What Should I Do?